Long ago, newlyweds were celebrated with a crumbling of wheat atop their heads, symbolizing fertility, bountiful harvest and good luck. The Victorians introduced wedding cake as a lavish symbol of those same virtues. Thankfully, the cake stuck; we no longer crumble wheat on the heads of newlyweds. My short engagement meant I spent just a brief moment as a fiancée and an even briefer moment in search of a wedding cake. My laissez-faire attitude toward my own cake notwithstanding, I jumped at the chance to attend a cleverly themed bridal shower: a cake-tasting event intended to help bride-to-be Charlotte Boutz select her wedding cake. An almond poppy seed cake by Happy Cake Co.
"I wanted to have an activity that would help people get to know each other, and I needed to pick cake flavors," says Boutz. On the recommendation of her wedding venue, Beacon Hill, Boutz chose Happy Cake Co. for the big day. She was impressed by the variety of cake flavors and knew she would get exactly what she wanted. Boutz's approach reflects a common trend you'll see this wedding season. Gone are the days of a lonely, plastic-looking cake sitting in the corner waiting to be trotted out, presented and forgotten. Wedding cakes have become more personal, a true reflection of the couple themselves. "A lot of people are doing rustic, less pretentious weddings," says Happy Cake owner Diana Tesdal. "People are choosing something closer to their heart." Tesdal crafts cakes with a designer's eye. They range from elegant and multitiered to simple, sweet and playful, and she's inspired by the ideas that couples bring to her at the first tasting meeting. "I've been baking for about 30 years," says Tesdal. "I love sitting down with the bride and designing her own cake. We love the custom part of it. We like to be challenged. We don't balk at anything." 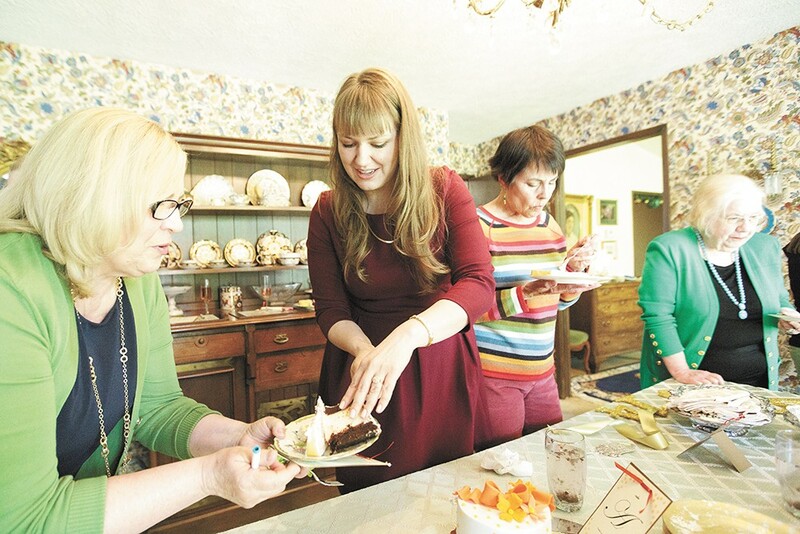 Bride-to-be Charlotte Boutz, center, serves Happy Cake Co.'s Tuxedo Cake with raspberry filling to Karen Fitzpatrick during a bridal shower. Tesdal's baking skills are impressive. Her lemon cake, layered with Key lime filling, is light and uplifting, a perfect finish to a substantial meal. Her popular tuxedo cake is a masterpiece of layers; chocolate and vanilla cake alternate with raspberry filling, offering a little something for everyone. Her fillings are enticing, her cakes have a perfect crumble and her fondant frosting is so light it melts in your mouth. Mika Maloney, the brainchild behind Batch Bakeshop, approaches baking with a similar awareness of form and function when she crafts her wedding cakes and sweets. Maloney has developed her baking style with a keen eye for the rustic and romantic. Though her career began as a wholesale baker for local small businesses, Maloney finds wedding cakes to be a welcome addition to her routine. "Doing wholesale, I didn't have a lot of interaction with people, and I realized I got to interact in a celebration, a time of indulgence. Partly because I didn't have a portfolio, the people who started coming to me had the more rustic flair," says Maloney. Maloney credits her relationship with local, seasonal offerings for her inspiration. "I'm influenced by flavor and what I see and buy at the farmers' markets. I read a lot of cookbooks. I look at wedding magazines and blogs, but I try and look at the bigger food trends," explains Maloney. "I like the line of savory and sweet. People respond well to that." Maloney's reputation for pairing flavors and offering beguiling combinations is well deserved. Her spicy ginger syrup cake is tempered by an impossibly rich vanilla buttercream. Her macerated-berries layer cake, adorned with just a touch of frosting and sliced almonds, is epically decadent and totally unpretentious. Recently, both bakers have seen great changes in the appearance of wedding cakes. Cakes are smaller. 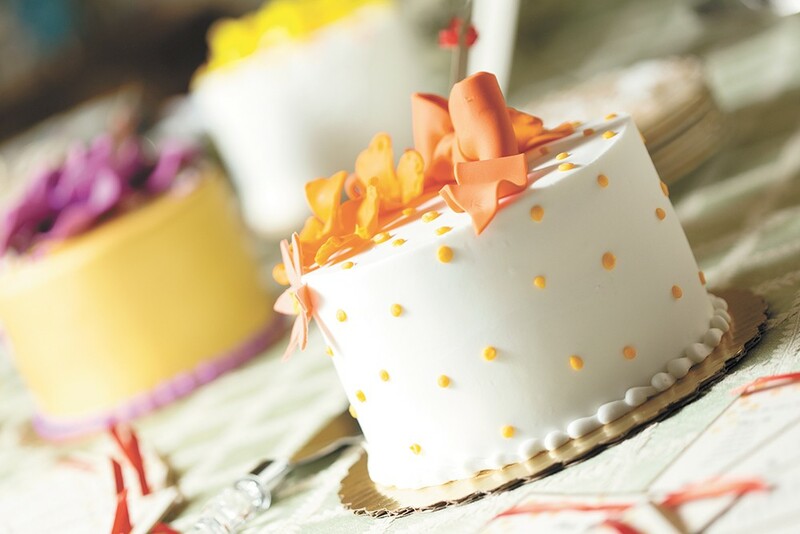 Frosting is textured into ruffles, ribbons or stucco. Colors range from metallic to hand-painted designs. 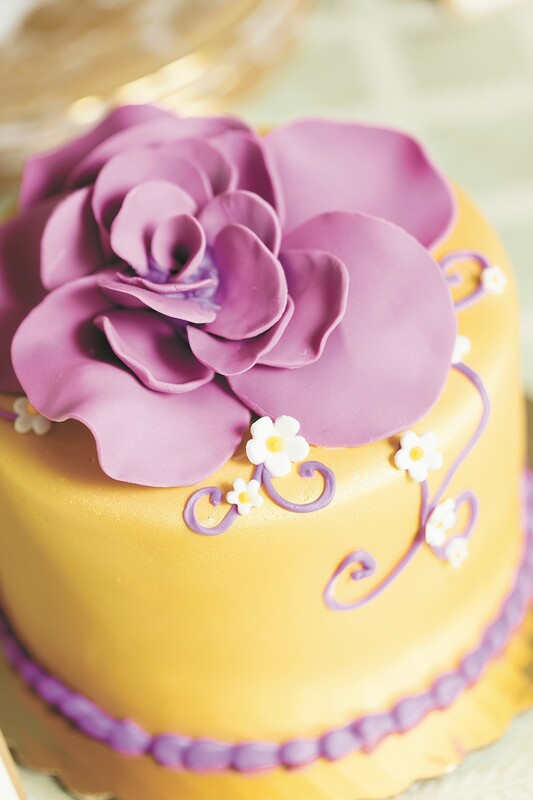 Flowers are shaped from fondant or plucked from gardens. Couples choose compelling flavors based on the season in which they are wed. Fruit fillings, light frosting or no frosting at all are popular for summer weddings; winter weddings see a move toward rich, opulent chocolates paired with mocha or caramel fillings.